Once the nursery season is officially over, we wait for the temperatures to be consistently cold in order to cover plants in the retail and stock area. This is somewhat tricky on account of the fluctuating weather we may experience in the fall here in Maine. 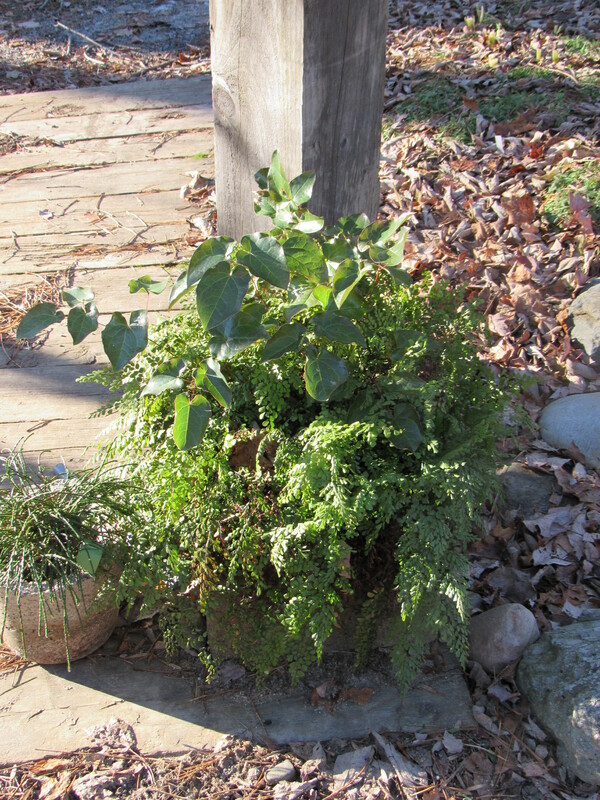 Many of the plants we over-winter are lined up and then covered in a specially designed winter ‘blanket’. Our ideal is to have the plants freeze and remain frozen, it’s the freeze-thaw-freeze-thaw that we’re most concerned about. Our mission is to protect the roots of the plants. Because some of the plants will remain in their pots and not in the ground, the roots are vulnerable and susceptible to damage if left without protection. Therefore, more care and consideration is needed. 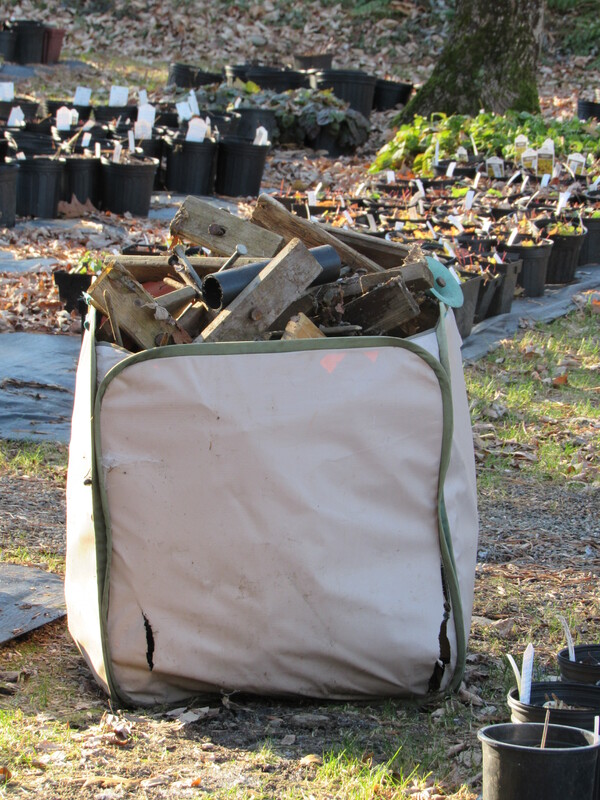 Our annual ‘covering of the pots’ truly marks the end of our growing season, the last big chore in the nursery. Of course, we also have a tremendous amount of plants that are over-wintered in growing beds, these don’t require any extra defense and will rely on the earth (and hopefully good snow cover) to protect them. 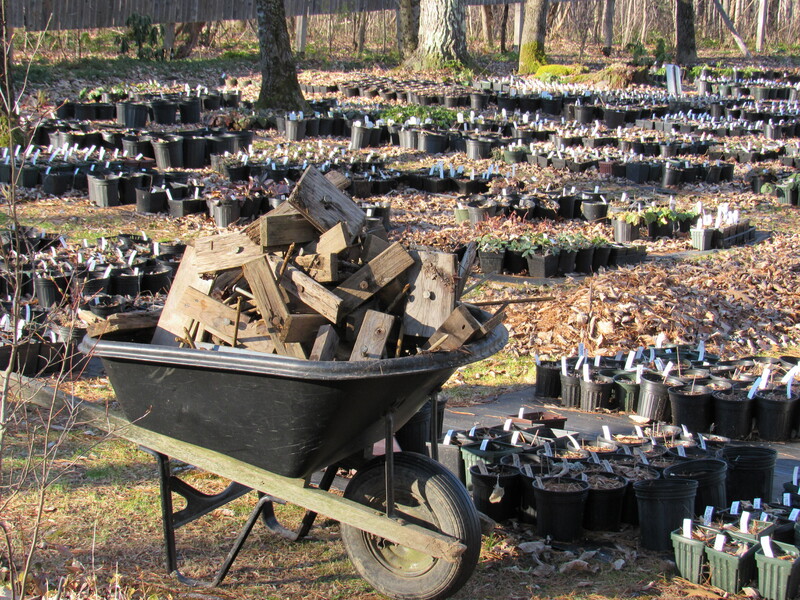 A patch-work of fall-related chores here at Fernwood as we welcome the winter season…we’ve processed this year’s supply of meat birds, the root vegetables are snug in the root cellar, and the firewood is (almost) all stacked in the woodshed. Hip Hip Hooray! Oh, and bread making! 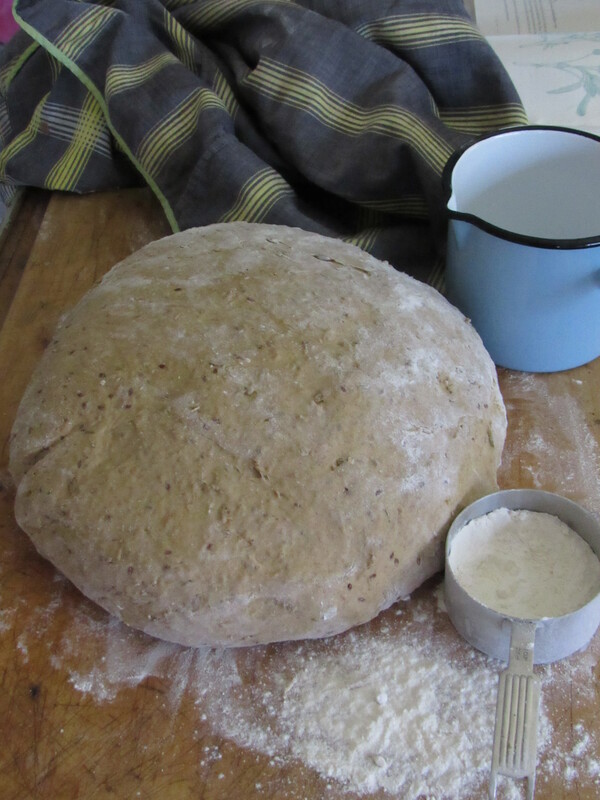 Regardless of the season, there is breadmaking! Once again we have been out covering rows of late harvested vegetables. Kale, swiss chard, broccoli, turnip, beets, and a bit more winter squash…..and even some peppers which continue to flourish in the large cold frames. The last of the hot peppers have been picked, then ground with vinegar and horseradish and made into hot sauce. The hoop house gets closed up to protect the salad greens and Fall spinach. A bit more cilantro and some radishes which are growing under cover, and late planted chard, are enveloped in remay (along with the last tomato plants in the hoop house, that we let hang on). I have to confess that we become truly energized by the somewhat urgent foraging, last minute harvesting, and collecting that goes on right now. Winter is around the corner, and the growing season will soon be behind us. Gathering the last of this year’s bounty becomes significant. Firewood is assessed. The freezers checked. Has the gas company been called to fill the L.P. tanks? Is hay storage accounted for? Do we have enough butter? A bulk supply of flour and oats? Rice and beans? These are the things we consider just before we head into winter. We are well aware of the seasonal shift. Sooner than we think we will be blanketed in a cover of snow. That’s o.k. We know how to be prepared for the long months of winter. We have enough food, we can entertain ourselves well, and the temporary lack of daylight doesn’t phase us. All of the chores that we hurry to complete are a part of that preparation. We feel confident in knowing that we have been part of this routine for a very long time and have learned from experience. It’s been a long time since we worried about the wood supply running out before the end of winter, and we know the uncomfortable feeling of counting hay bales in March, hoping they’ll last until the pastures green up. One learns these things from years and years of doing, and also by a few mishaps. Second cut hay is at a premium come late March or April, so falling short can be a lesson well learned. We all do have to learn these things and the past stings of ‘falling short’ are good reminders. As the winter months draw near, we write a check list and consult it daily ( I think the winter check list actually gets written sometime back in June). We know we’re at the tail end of the seasons that allow us to grow our food and stock up. Things are changing fast. Soon the sheep will be brought home to their winter pasture, and a light goes on in the chicken coop to create extended daylight. Now, morning at the breakfast table begins in darkness, and by the time you’ve finished your second cup of coffee, the sun is up. We take great care and interest in preparing for the cold and dark months of winter. We feel truly engaged and alive ( thoughtful) in the process of doing so. We know that our forefathers had a much more critical dependency on preparing for winter, but I think the imprint to do so is still ingrained. We’re glad for this. We know where to look for guidence and counsel. It is not lost. These traditions and skills are still accessable along with the desire and commitment of living sustainably.There is still the instinct to take care of oneself, one’s family, one’s community. We know this. We practice this approach to living. And thank goodness it is still there to be retrieved and brought forward, to apply to our daily way of living, even in today’s world….especially in today’s world. I think it matters as much now than it ever could. We really feel this way. So out we go, just before dark, to cover those last bits of garden bounty. To honor the good and hard work of growing one’s own food. To be mindful of the ways we prepare and ready our household with all the things it needs to manage through the winter months. Living this way is not a burden, it is hard work, but we choose it and know in our hearts why we do. There is tremendous gratitude and a good sense of accomplishment in doing so. Beside, your own homegrown beets,roasted with garlic and onions, along with some home pressed cider to wash it down with, can taste pretty darn good come February.